Raspberry is a sweet and tangy addition to salads and a number of entrees. The vinegar can be prepared months ahead of time and makes a thoughtful gift, especially if the recipient is a food enthusiast, or a fan of raspberries. To take advantage of the raspberries available this season, we’ve discovered an incredibly useful resource that will walk you through how to make a homemade raspberry vinegar that is versatile and delicious. It is based on canning ideas but won’t require any formal canning equipment. However, if there are canning classes available at your local community center, consider taking a few classes and discover how to can fruits and vegetables or make preserves. The class will likely expose you to new ways to can your favorite fruits and take advantage of seasonal fruits and vegetables. To make homemade raspberry vinegar, it’s best to buy fresh, local raspberries if you can. If not, organic raspberries will work just as well. But, supporting your local farmers is always a plus! Raspberries are a significant source of vitamin C, which protects the immune system, and possesses a sweet and tart taste that pairs well with lots of other foods. Making the raspberry vinegar doesn’t require any fancy kitchen equipment, and you will only have to invest a few minutes to put the ingredients together. However, as with most infusion projects, you’ll need to allocate a few days for all the flavors to mix together so that you will end up with a great edible gift. Ultimately, only two ingredients are needed for this fabulous recipe and the directions are easy to follow. 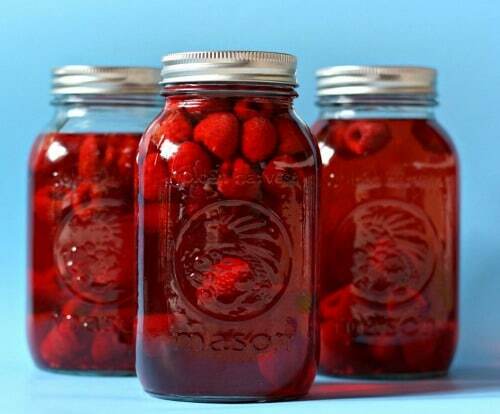 You can pour your delicious raspberry vinegar into decorative jars and give as a gift. You can even create decorative labels to personalize them. Of course, the best part is being able to keep some for yourself to make your favorite recipes. For instance, consider marinating chicken breasts in the vinegar, or use it in your favorite beef stew recipe. You can also add olive oil and sea salt to the vinegar if you want to use it to dress your fruit or vegetable salad.